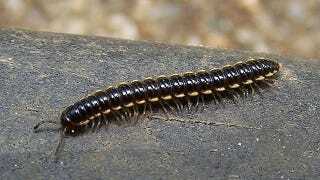 The Australian island Tasmania is home to two species of millipedes. These insects only ever meet on a tiny, 300 feet wide patch of land running right down the island. It's a bizarre arrangement, and it has biologists completely baffled. It's not uncommon for two similar species to occupy territories that meet but don't overlap — or, as in this case, only overlap for a very short amount of space. This is known as parapatry, and usually it's the result of some geographic feature that limits the movement of the two species, like a long ridge or a region of extremely heavy rainfall. But there are no such features that demarcate the boundary between these two species of Tasmanian millipedes. Dr. Bob Mesibov of the Queen Victoria Museum in Launceston, Tasmania explains that "the boundary runs up and down hills, crosses rivers and different bedrocks and soils, and ignores vegetation type and climate differences", which is completely unlike any other known instance of parapatry. Dr. Mesibov describes this as "an unexplained biological arrangement", and it really is as though these two species long ago sat down and worked out a treaty determining the borders of their two lines, leaving that narrow space in between as a sort of millipede demilitarized zone. Just to add to the craziness, this particular boundary line is far longer than any other known parapatric boundary, and indeed it's even 50% longer than the boundary between England and Scotland - and, as Dr. Mesibov wryly observes, "the 'border control' is a lot better than what we humans can do." For now, this whole thing is a rather wonderfully ludicrous mystery, at least until we find some millipedes crossing from one territory to the other while carrying little millipede passports. Via ZooKeys. Image by Oriolus84 on Flickr.